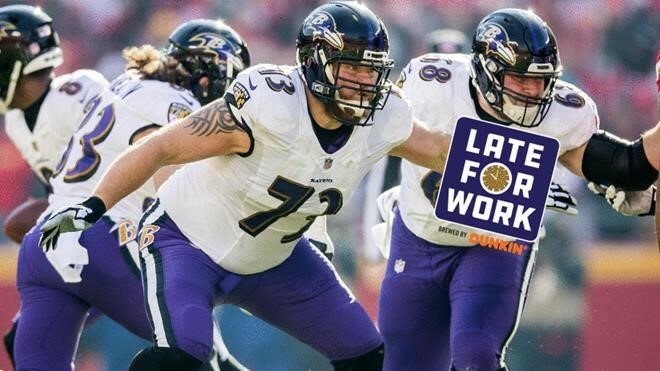 Any speculation surrounding Marshal Yanda’s immediate playing future was silenced after the Pro Bowl guard agreed in principle to a one-year contract extension Thursday. Yanda’s new deal keeps him in Baltimore through the 2020 season, but could his final destination be in Canton, Ohio as a Pro Football Hall of Famer? “If Yanda continues to play at a high level for the next two years, it will increase his candidacy for Canton,” ESPN’s Jamison Hensley wrote. “On the field, Marshal Yanda is quiet and lets his play do the talking for him,” Ebony Bird’s Richard Bradshaw wrote. 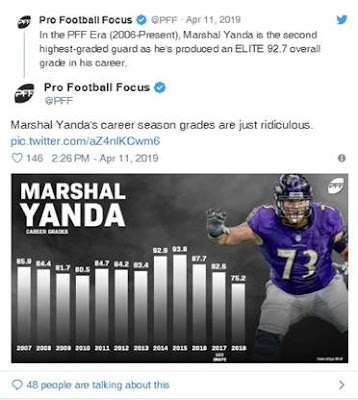 “While being far from a gentle giant, Yanda is certainly not someone you want to go up against on every snap. According to Pro Football Focus, Yanda is the league’s second highest-graded guard (92.7) with at least 5,000+ snaps since 2006. Best known for his dominance at guard, Yanda has also excelled at multiple positions on the offensive line. Having said that, it’s extremely tough to get into the Hall of Fame as a guard. Only 20 guards have been enshrined in NFL history. Steve Hutchison, Alan Faneca, and Tony Boselli failed to make the 2019 class. Former Green Bay Packer great Jerry Kramer, who retired in 1968, was the last guard to be enshrined (2018 class). 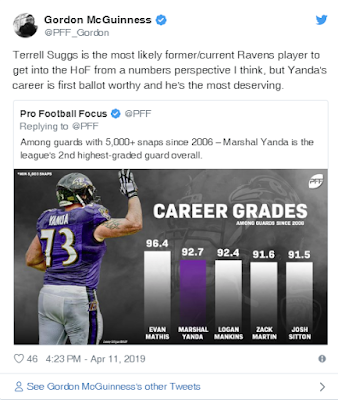 “Because Yanda plays one of the league’s least glamorous and celebrated positions, it’s tough to evaluate his chances of eventually being enshrined in Canton, Ohio. He’s been one of the top guards in the sport for nearly a decade. He’s regarded as one of the toughest players to ever wear a Ravens uniform. He’s been on a Super Bowl winner,” The Athletic’s Jeff Zrebiec wrote. 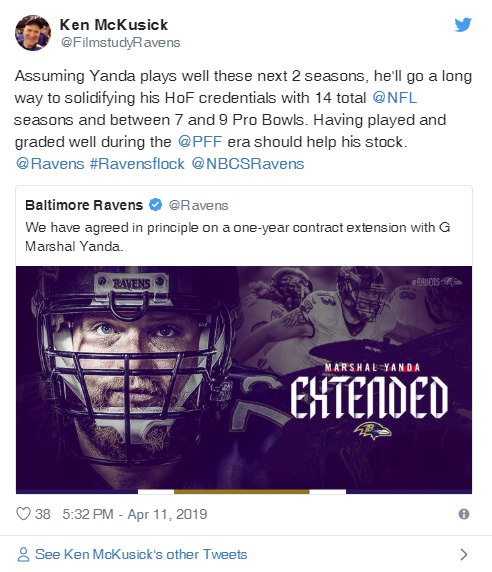 Yanda will have at least two more seasons to strengthen his resume, and he’ll continue to serve as a key component in the run game under Offensive Coordinator Greg Roman.